Wheatgrass is prepared from the common wheat plant. It is sold either as a juice or powder concentrate. It is also available in many health food stores as fresh produce and tablets. 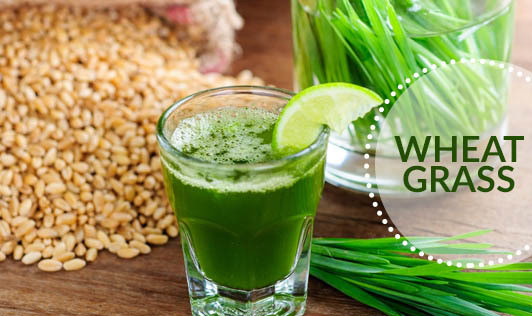 Wheatgrass provides a concentrated amount of nutrients - amino acids, chlorophyll, enzymes, iron, calcium, magnesium, vitamins A, C and E.
Wheatgrass fans say that its rich nutrient content boosts immunity, kills harmful bacteria in the digestive system, and rids the body of waste. Some proponents tout wheatgrass for cancer, anemia, diabetes, constipation, infections, skin conditions, colon cleansing, ulcerative colitis and joint pain, among other health concerns. These claims have not been reliably substantiated and there are no significant research studies to support wheatgrass health claims. The average dosage normally taken is 3.5 grams (powder or tablets). Some have 30 ml of the juice freshly-squeezed once daily or, for more therapeutic benefits, higher dose up to 60 - 120 ml taken 1-3 times per day on an empty stomach and before meals. For detoxification, some may increase their intake to 3-4 times per day. Some users may experience nausea or headache. This would go away after a while. Hence, it is advisable to first start with a small dosage and slowly increase it if there are no severe reactions. By far the best way is to juice it yourself and drink it within minutes. The wheat grass juice has a very strong ‘grassy taste' and may take some time to get used to. If you find its taste too strong, then mix it with other juices for a more palatable combination. Try mixing it with lemon juice - it gives an interestingly refreshing taste!